Party rentals may or may not be included within the price of our catering package depending on the location of your event. We provide all necessary rental equipment within the price of our catering package at most of our premiere venues. These rentals and equipment include tables, chairs, linens, chair covers with bows, and all necessary equipment to prepare and serve your event including china, stemware, silverware, chaffing dishes, serving trays, coffee urns, portable ovens, refrigeration and barware. When we cater off-premise events, tables, chairs and linens, while ordered and coordinated by us, are at an additional charge. 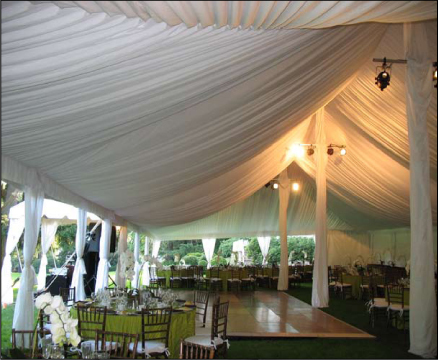 Many of our outdoor catered events also require tenting and tent accessories including lighting, heating, fans, air conditioning, dance floor and staging for musicians. We have the expertise to order and coordinate all of the equipment required for your particular event.